This is the first product we’ve tested from Tundra, a British company that sources its down and manufactures in Poland– and we’ve been suitably impressed by their wares! 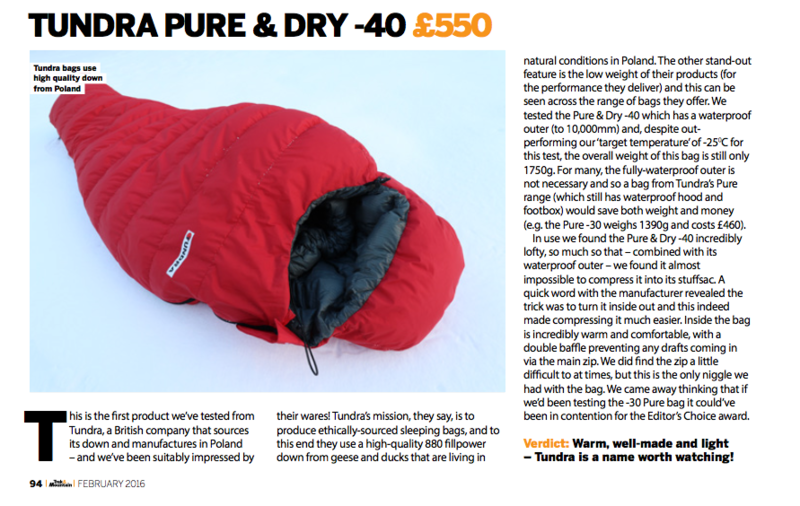 Tundra’s mission, they say, is to produce ethically-sourced sleeping bags, and to this end they use a high-quality 880 fillpower down from geese and ducks that are living in natural conditions in Poland. The other stand-out feature is the low weight of their products (for the performance they deliver) and this can be seen across the range of bags they offer. We tested the Pure & Dry -40 which has a waterproof outer (to 10,000mm) and, despite out- performing our ‘target temperature’ of -250C for this test, the overall weight of this bag is still only 1750g. For many, the fully-waterproof outer is not necessary and so a bag from Tundra’s Pure range (which still has waterproof hood and footbox) would save both weight and money (e.g. the Pure -30 weighs 1390g and costs £460). In use we found the Pure & Dry -40 incredibly lofty, so much so that – combined with its waterproof outer – we found it almost impossible to compress it into its stuffsac. A quick word with the manufacturer revealed the trick was to turn it inside out and this indeed made compressing it much easier. Inside the bag is incredibly warm and comfortable, with a double baffle preventing any drafts coming in via the main zip. We did find the zip a little difficult to at times, but this is the only niggle we had with the bag. 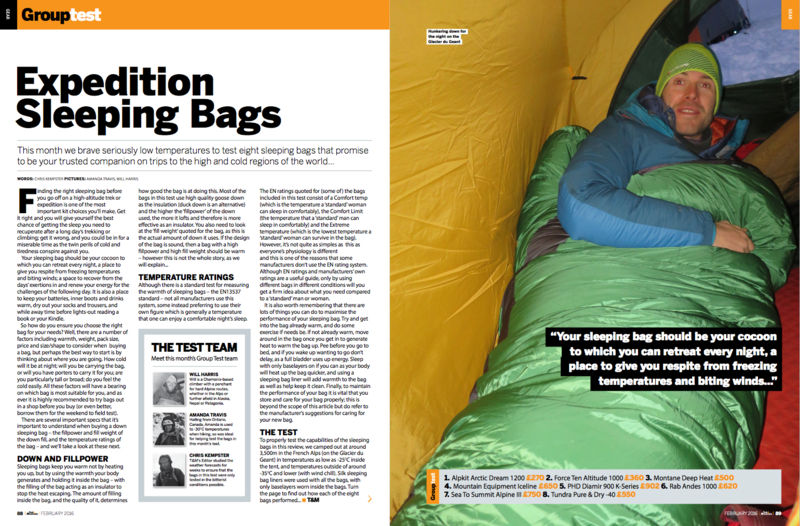 We came away thinking that if we’d been testing the -30 Pure bag it could’ve been in contention for the Editor’s Choice award. Warm, well-made and light – Tundra is a name worth watching! Buying from the United States?